Whether you’re looking to spark something new, or adapt to change around you, making a fresh start tends to bring out the best in us. It moves us to a place where we are most creative, optimistic and resourceful – all to ensure we achieve great improvement or reach a new plateau. Maybe that explains why a fresh coat of paint, a new hairstyle or even something more substantial like a new career makes us feel more alive. At Distributel, we work tirelessly to make switching to our Internet, Home Phone and TV services as simple as possible. Once you do, you’ll enjoy the best range of services, at unbeatable value. Neighbourhood by neighbourhood, street by street, only Distributel knows the best Bundle solution for your home. Call us at 1-877-810-2877 or click here to learn how you can make a fresh start by switching to Distributel today. Distributel will be awarding one lucky winner with the gift of starting fresh this Fall. 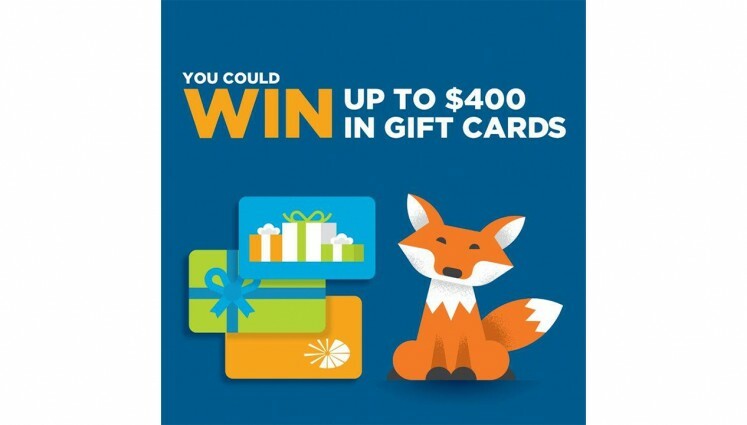 You could win up to $400 in gift cards. “Like” our Facebook Page or follow us on Instagram, share our contest post, and use #StartFresh in the comments section. On September 29, we will conduct a random draw from all valid entries, and the lucky winner will receive a $200 gift card from Best Buy, The Home Depot, Staples or Bed Bath and Beyond. If the winner is also a Distributel customer, we will double the value of the prize to $400. You can also enter to win the grand prize offline and without being a Distributel customer. See full Contest Rules below for more details. There will be a total of one (1) prize awarded in the Contest: either a two hundred-dollar ($200) or four hundred-dollar ($400) gift card from one of the following merchants: Best Buy, The Home Depot, Staples or Bed Bath and Beyond. Eligibility for the higher or lower value prize depends on the winner’s satisfaction of the criteria outlined within these Official Contest Rules & Regulations (the “Rules”). The Contest winner may choose a gift card from any of the listed merchants and the Sponsor will procure and deliver it by mail or electronically depending on method used by the merchant. Social Media: To be eligible to win, contestants must “Like” the Distributel Facebook Page and Share the contest post while also entering #FreshStart in the comments section of the Contest post on Facebook. Instagram users must “Follow” Distributel at @distributelcommunications and “Reshare” the Contest post using #FreshStart in the comments section. Distributel Customers: Distributel customers whose accounts are in good standing will have their prize value doubled if their name is selected in the random draw and they meet the other eligibility requirements as outlined in these Rules. Offline entry and no purchase necessary: To enter the Contest offline and/or be eligible for the prize value being doubled without being a Distributel customer, Contestants may legibly handwrite or print on a piece of paper their name, address, and telephone number(s) plus a 500 word original essay about “Why I Need a Fresh Start” and mail the completed paper, with sufficient postage to Distributel Communications Limited located at 177 Nepean St. Ottawa, ON K2P 0B4 care of “Distributel Marketing- Make a Fresh Start Contest”. The Contest is open to any person eighteen (18) years of age or older at time of entry, who is a Canadian citizen or permanent resident of Canada, residing in Canada, on the Contest closing date. Void in whole or in part where prohibited by law. Employees of the Distributel group of companies are not eligible to win. The Contest opens on September 8, 2017, and to be eligible, contest entries must be received online, or by mail at the address listed above, before 11:59 p.m. EST on September 28, 2017. A winner will be randomly selected on September 29, 2017, and eligibility as per these Rules will be verified. Once a qualified winner is selected, the name will be announced on Facebook and Instagram on September 29, 2017. If the winner is an offline Contestant, they will be contacted via the contact information they provided upon entry. The winner must answer a skill testing question to receive their prize. Odds of winning will depend on the number of eligible participants who enter the Contest, and the number of Contest Entries submitted during the Contest Period. By entering the contest, contestants agree to be bound by these contest Rules and agree that all decisions made by the Sponsor with respect to all aspects of this contest are final and not subject to challenge. These rules may be amended at any time by the Sponsor without notice. The Sponsor expressly reserves the right to take any steps it deems necessary in its absolute discretion, including the limiting of entries and the exclusion of contestants, in order to ensure that the contest is conducted in a fair way for all contestants. Distributel Communications Limited and its employees, agents, representatives, promotional agencies, and assignees shall not be responsible in any way for loss or damage arising from the use of or, bear any liability whatsoever in any way attributable to, the prizes awarded in this contest or the entry by any contestant herein. Without limiting the generality of the foregoing, Distributel Communications Limited assumes no responsibility or liability for any risk or dangers associated with the acceptance or use of the prizes awarded as part of this contest or any liability associated with or arising from online or electronic entries, and expressly disclaims liability from loss or damage to a contestant’s, or any other person’s, computer system or other hardware resulting from participating in the contest. All entries, including essays and Facebook videos, become the property of Distributel Communications Limited and will not be returned. Distributel Communications Limited is not responsible for any lost, misdirected, illegible, incomplete or delayed entries. By entering the contest, contestants approve the use of their personal information for the purpose of administering the contest and for ongoing Sponsor promotional messaging, and, if they are awarded a prize, for promotional purposes through any medium (including but not limited to online, print, social media, TV, and radio mediums) and including in connection with any subsequent similar contest held by Distributel Communications Limited, without payment or compensation whatsoever. This contest is subject to all applicable, federal, provincial, and municipal laws and regulations and any dispute relating hereto will be determined by an Ontario court applying Ontario law and the laws of Canada as applicable therein. This Contest is void where prohibited. Distributel Communications Limited may, in its discretion, cancel, suspend or modify this contest, without liability to anyone whatsoever. By entering the Contest, entrants agree to be bound by the terms of the Rules which are subject to change without notice to Contest entrants individually, and to the decisions of the Sponsor which are final and binding. By entering and completing the Contest, entrants consent to the collection, use and disclosure of their names for the purposes of administering the Contest and for ongoing Sponsor promotional communication. Acceptance of the Prize constitutes permission for the Sponsor to use such winner’s name, city and province of residence, photo and likeness for advertising and promotional purposes in any media throughout the world forever without compensation, notification or further permission. By entering the Contest, each entrant releases the Sponsor, and each of their respective affiliates, parent companies, subsidiaries or related companies, and each of all such companies’ directors, officers, employees, representatives and agents (collectively referred to in these rules as “Releasees”), from any damage, loss, cost or liability suffered as a result of or arising from the entrant’s participation in the Contest or the claiming and/or use of the Prize. Each of the Releasees disclaims any liability whatsoever relating to, and none of them shall in any way be responsible for, any lost, misdirected, incomplete, illegible or delayed entries, any computer, Internet or other similar outages; for delayed or lost transmissions or site shutdowns, or other similar or equivalent events that may occur. The Releasees are also not responsible for any technical, computer or human error which may occur in the processing of entries, the announcement of the prize, or the contacting of the selected entrant and the Sponsor shall be entitled to rely solely upon the winner’s declaration as to eligibility in awarding the Prize to such winner, without any review or investigation whatsoever being required on its part or on the part of any of the Releasees to the end of confirming the completeness, truth or accuracy of the declarations made therein.